The MI-11/24 Oil Skimmer, operating on a rotating disk principle, is specifically designed to recover lighter oils and in particular diesel fuel. 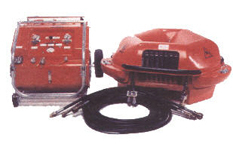 The quickly deployed diesel/hydraulic disk skimmer driven by a remote power pack, has a self- contained capability to handle smaller oil spills. Its self-contained positive displacement pump is rated at 30 gpm at 1800 rpm. MI-11/24 skimmer head with 50 feet (15.2 m) of 1½ in. (37 mm) discharge hose complete with quick-disconnect fittings. Yanmar diesel/hydraulic power pack with fuel and hydraulic oil reservoirs. 3 hydraulic control hoses 50 feet each (15.2 m) complete with quick-connect fittings. Hydraulic control hoses in 75 foot lengths with 2 inch protective cover. Extra discharge hoses available in 50 foot lengths.